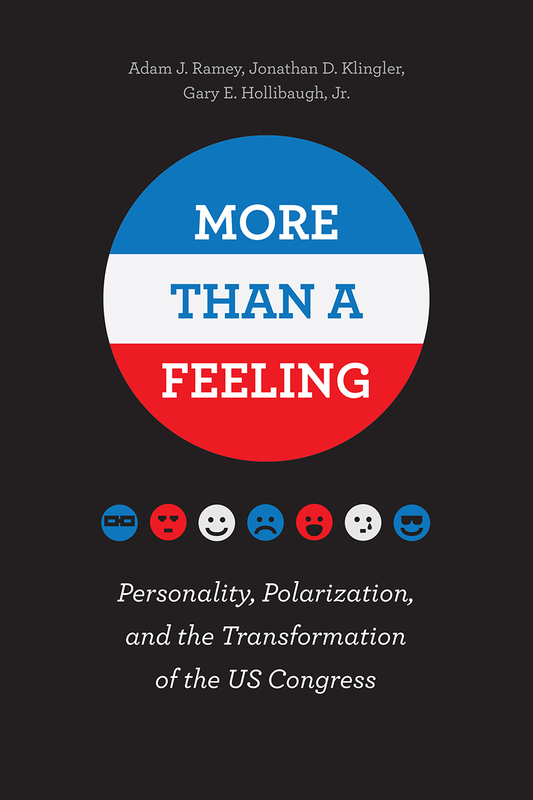 More Than a Feeling: Personality, Polarization, and the Transformation of the US Congress, Ramey, Klingler, Hollibaugh Jr.
Adam J. Ramey, Jonathan D. Klingler, and Gary E. Hollibaugh Jr.
See the online appendix for chapter 8. Whatever you think about the widening divide between Democrats and Republicans, ideological differences do not explain why politicians from the same parties, who share the same goals and policy preferences, often argue fiercely about how best to attain them. This perplexing misalignment suggests that we are missing an important piece of the puzzle. Political scientists have increasingly drawn on the relationship between voters’ personalities and political orientation, but there has been little empirically grounded research looking at how legislators’ personalities influence their performance on Capitol Hill. With More Than a Feeling, Adam J. Ramey, Jonathan D. Klingler, and Gary E. Hollibaugh, Jr. have developed an innovative framework incorporating what are known as the Big Five dimensions of personality—openness to experience, conscientiousness, extraversion, agreeableness, and neuroticism—to improve our understanding of political behavior among members of Congress. To determine how strongly individuals display these traits, the authors identified correlates across a wealth of data, including speeches, campaign contributions and expenditures, committee involvement, willingness to filibuster, and even Twitter feeds. They then show how we might expect to see the influence of these traits across all aspects of Congress members’ political behavior—from the type and quantity of legislation they sponsor and their style of communication to whether they decide to run again or seek a higher office. They also argue convincingly that the types of personalities that have come to dominate Capitol Hill in recent years may be contributing to a lot of the gridlock and frustration plaguing the American political system. 4.1 Who Attracts Quality Challengers? 9.1 Moving On or Moving Out? "In the end, the reader cannot but agree with the authors when they write in the conclusion that 'personality matters both theoretically and empirically' . . . They provide keen insight into what makes the individual members of Congress tick."